European dysfunction is making Trump’s economic ‘strategery’ look prescient. We all know that Trade Wars are bad for all economies, yet the US economy accelerated in 2018 while all others have slowed to a crawl as US tariff threats across multiple continents became reality. Perpetually fractured European leadership sat on its hands in recent years deferring to full on monetary policy and negative interest rates (0 to 8+ year maturity yields remain negative today). Dumbfounded Euro politicians just watch their currency tumble and cross their fingers and toes that the US and China will raise the tide to lift their boat. Until the US saves the day, the Euro sinks and the Dollar shines. Although the strength or weakness of an economy has little to do with the value of its currency, the comparative GDP rate of change versus another country or basket of countries is critical. It’s not how fast I run, but how much faster I run than you when being chased by the economy Bear. If analysts were told that the US economy would slow and interest rates would fall for the past 4 months, many would guess our US Dollar would have depreciated. The slowing US growth rate isn’t decelerating as fast as Europe and is sending the Dollar close to 18 month highs, deflating commodity markets. As the certainty of a new Trade Deal with China becomes more apparent the markets should pencil in a top for the Dollar in anticipation of a global rebound benefiting Europe. The Euro fell sharply against the Dollar last October when their more export oriented economy fell victim to the global slowing more than the faster growing import based economy of the US. The dog ate my homework excuses for a sluggish Eurozone abound: New emissions standards hurt German Autos, Yellow Vest protests hurt France and Italy blames Germany for retarding its growth. This week the Euro fell under its key support near 114, but quickly rebounded upon the news of strongly improved odds of a trade agreement with China in March or soon afterwards. We have been expecting a 1st quarter top in the US Dollar (low in the Euro) as the prospects of an Eurozone economic recovery accelerating faster than the US begins to be discounted. Visualizing the more rapid deceleration on the European continent as compared to the North American continent can be seen with more clarity by examining Purchasing Manager indices (PMI). 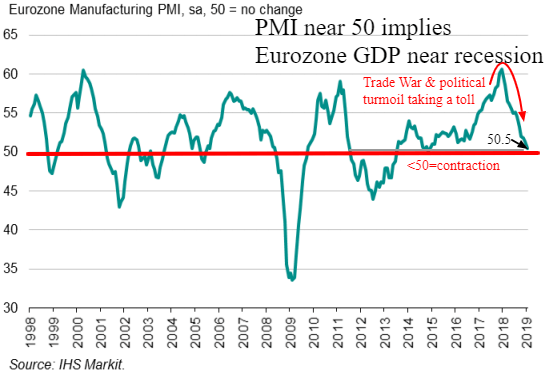 After a strong Euro GDP led by their exceptional PMI’s in 2017, European PMI’s have now completed a 180 to the downside and now hover on the verge of a continent wide contraction. The PMI’s more recently have been temporarily depressed by contracting industrial production led by a severe downturn in the automobile sector, post new emission regulations. 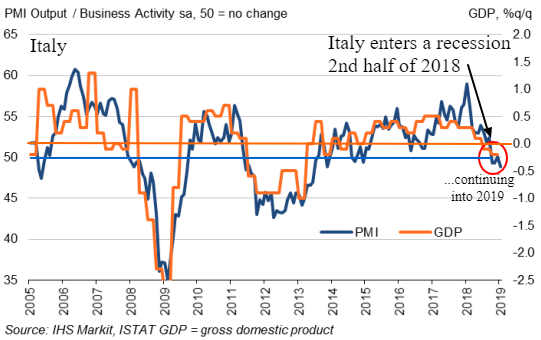 Yellow Vest turmoil in France and a recession in Italy have also pushed the Eurozone manufacturing sector to the brink of an overall contraction. Without a boost in optimism and spending from a potential US and China trade agreement, the Eurozone may bottom near zero growth in early 2019. 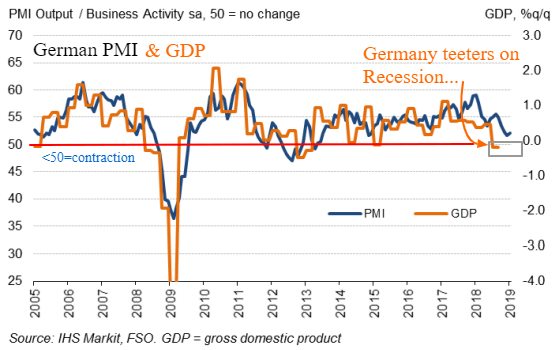 Even the perennial European leadership housed in Merkel’s Germany is slipping toward recession territory. Businesses are holding on to workers and avoiding major cost cutting in hopes of a rising tide rebound after a US and China trade agreement is reached. Should a trade deal be delayed indefinitely and exports drift even lower, then Germany and all of Europe will start shedding workers and shrinking capacity more rapidly, exacerbating the overall slowdown in Europe. We favor a the framework for an agreement with China in March and a 1st quarter low in European growth with modest reacceleration for the rest of 2019. 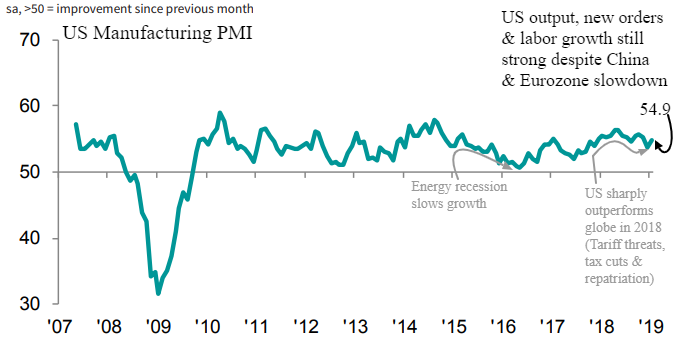 US PMI in Manufacturing and Service sectors have surprised most investors and are consistent with a GDP just over 2%. Like Europe there is a partial discounting of an eventual US and China deal that mildly reaccelerates economic growth in the US, justifying the strong expansion of our labor pool. The transportation channel checks and order flow in manufacturing and service sectors of the US are surprisingly buoyant in a world a sinking ships. Comparing the growth rates of the top Euro economies in 2017 and 2018 against the US the Dollar weakness in 2017 and Dollar strength in 2018 is empirically logical. Despite the strong US out performance over the past 9 months compared to Europe, we expect the relative growth from lower levels will favor the Euro and other trading partner currencies over the Dollar in the final 2 or 3 quarters of 2019. This will lift commodities, emerging markets and large cap cyclical stocks that have been severely depressed. We know the lesson of the 1930’s beggar thy neighbor trade wars that helped turn a major recession into a long term Depression. However, Trump assessed that such a trade war escalation evolving from his war on the world was unlikely and has used his Bull in the “China Shop” persona to seemingly transfer growth from our major trading partners to the US. While the US trade deficit reached a new peak in 2018 and is unlikely to fall measurably in 2019, the US growth and intellectual property protection are the real goals. By those measures it appears that the US is navigating the dangerous waters of a global trade war with aplomb which will be confirmed should a rebound in optimism and growth rates materialize soon after a trade deal is enacted.